Our cabin is everything that comes to mind when you think of a mountain cabin: cozy, quaint, rustic, a crackling wood-burning fireplace, cups of hot chocolate, smores, peace and tranquility. 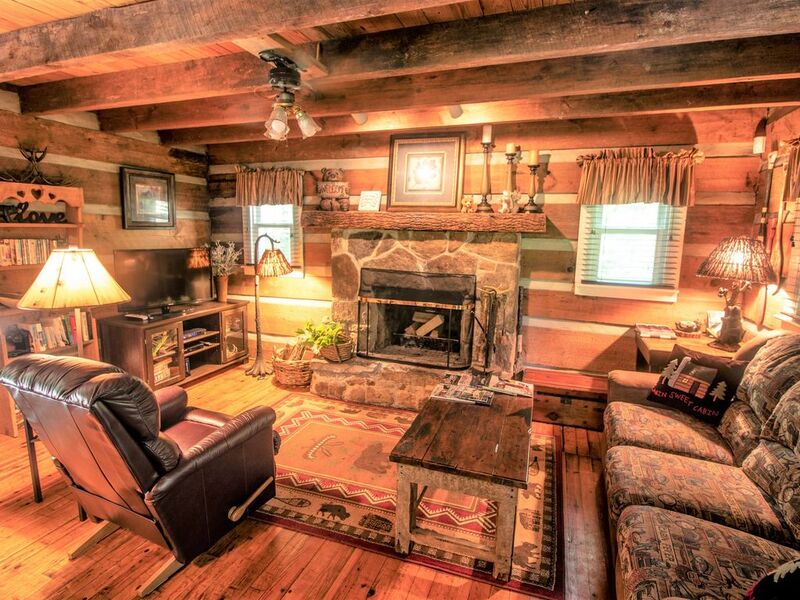 Our totally private secluded cabin is surrounded by the Nantahala National Forest. It has a fully equipped modernized kitchen, two bedrooms upstairs and a bathroom downstairs. The master bedroom has the wonderful Marriott king size bed, the second bedroom has the same comfy queen size Marriott bed. The stairs to the bedrooms are steeper and narrower than normal (see the pictures); if you have any physical limitations related to stairs, this cabin may not be a good match for you. Located about 5 miles off the main road between Cashiers and Highlands, the half-paved and half-gravel road leads you through the Nantahala National Forest. The roads are abundantly lined with mountain laurel, making for a beautiful drive, especially in the spring. The main living room has a huge stone hearth wood-burning fireplace, a double reclining sofa and matching recliner chair (both are great for reading by the fire! ), a book case loaded with books left by our guests, video library, knotty pine hardwood floors throughout. The front porch has a porch swing built for two (or three), relaxing rockers, and a gas BBQ grill. The covered back porch has a dining area overlooking the back yard with a fire pit surrounded by Adirondack chairs, a soothing waterfall trickling into a small man-made pond, lounge chairs and a hammock, all perfect for stargazing at night on warm summer evenings (comfy blankets to cuddle in are available). Nearby are many waterfalls and hiking trails for any fitness level, from a slow meander thru mountain laurels, to challenging steep hikes to the tops of mountains. The sheer cliffs on Horse Cove Road closer to Highlands are astounding. The trail head of the Ellicott Rock Wilderness Area of the Nantahala National Forest is less than two miles away and we are three and a half miles from the Chattooga River where you can find the Iron Bridge. Swimming, boating, water sports, lake-shore picnics are a short drive away at Lake Glenville. Lake Jocassee, and Lake Toxaway. Although the pond near the cabin is privately owned by another homeowner with no fishing allowed, there are plenty of birds and other wildlife to view and photograph at your leisure. Highlands has many fabulous boutique shops, including The Dry Sink and small cafe's for coffee and lunch, or spoil yourself with a fancy meal at the Old Edwards Inn and a few other lovely restaurants for a nice dinner. There are two grocery stores in Highlands, one regular and one gourmet. Cashiers has a farmers market from the Spring to Fall with many locally grown produce, jams and jellies, steaks for the grill, and many other treasure items to find and explore. We get many inquiries about whether the cabin is available on certain dates. The HomeAway calendar is always accurate...if it shows the dates are available, the cabin are available for you. The map on our HomeAway profile accurately shows the cabin location. Please refer to your favorite map engine (eg, Google Maps) to determine distances to other towns and landmarks. Kathey was born and raised in South Carolina, graduated the University of South Carolina (Go Gamecocks! ), and has a successful real estate business in and around Columbia. She has spent many days wandering this area when as a child, she and her parents built a cabin nearby. Chris works in IT with a Fortune 50 company. He has travelled extensively throughout the US and Europe, enjoying the local cultures found in the back alleys and small restaurants instead of just seeing the obvious tourist sites. We have two adult children and two cats. Prior to purchasing our cabin, we stayed there many times over the years and always felt that it was someplace very special. We use HomeAway almost exclusively when we travel and shy away from cold, generic hotel chains, although we occasionally succumb to the pampering and room service at a nice resort. Unlimited nation-wide calling. No cellular service at the cabin. Washing machine is in the basement, soap and softener are provided. Clothes dryer is in the basement, softener sheets are provided. Parking for 2 cars, RV's are not allowed. Glasses, dishes and utensils are provided, including disposable cups, plates and flatware for you to take on your picnics. Bar-style dining area is available in the kitchen/living room, outdoor dining on the back porch. TV is in the main living area by the fireplace. Our bookcase is filled with books left behind by previous guests. Please review the pictures of the indoor stairs leading to the bedrooms....they are slightly steeper than you may have at home. Most people find that quaint and charming, adding to the cabin feel, but they may be challenging to some with limitations. We enjoyed our stay. Well stocked cabin and great fire place. The stairs to the second floor are very steep and the waterfall did not work. Super quiet, well stocked and secluded. Met a neighbor and his dog Lucy...great and funny guy. The beds were comfy, loved the dining area on the back porch. Only thing to be aware of is that the stairs are very steep and the bedrooms are upstairs and the bathroom is downstairs. We will definitely stay here again. We had a great stay in the Nantahala National Forest. Reasonably convenient to two nice towns (Cashiers & Highlands). But the highlight is the access to many, many outdoor opportunities. We were able to hike on the Foothills Trail just across the state line, Panthertown Valley, Whitewater Falls, & the Ellicott Rock Wilderness. This was just "tip of the iceberg". The Whitewater, Thompson, & Chattooga Rivers were beautiful as were the many waterfalls. The cabin suited our needs well. They have done a fine job providing everything you would want or need. Small, cozy, beautifully appointed, fantastic fireplace, & lots of comfortable space to hang out outside. We cooked all of our meals there. Yes, the stairs are steep, Yes, there is no bathroom upstairs with the bedrooms. Yes, you must drive on unpaved roads. These are all clear before you sign up & we didn't find them to be detrimental. The forest is lush. The roads & trails are empty. The Hennessy cabin is a wonderful way to get off the grid and recharge. Hiking nearby was quietly beautiful. Highly recommended. I had everything we needed and wanted. Thanks. The cabin was everything we imagined. It was cozy with a wood burning fire place. We love the back porch and yard too. We want to come back in the summer months. The cabin was clean and we'll maintained. Access to this property, especially the driveway, is not suitable for trailers (boat, ATV, etc) or large vehicles (RV, etc).